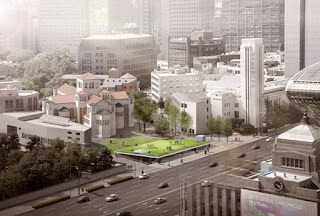 For the site of the former IRS branch between the Anglican Cathedral and City Hall (see '"Sejongdaero" competition officially started'), Seoul opted for an American team, Terminal 7 Architects. Their concept, 'Seoul Chronicle', keeps it simple, with a lawn discretely revealing the existence of underground levels - the piece de resistance in last July's brief. Gone from the surface are the pilars of a building that anyway didn't deserve any memorial. The actual stars become the Deoksugung walls and trees, the Cathedral, and passers-by. So what has been swept under this new green blanket? 3 underground levels of whatever fits in, and more interestingly a vast space that could become a popular venue with its vertical garden and its spectacular urban slice exposing bare layers of Hanyang / Seoul. As is often the case in this most central neighborhood, more artifacts are likely to be unearthed across the site during the work. Overall, a rather minimalist approach that comes as a relief compared to "Seoul Tsunami City Hall, The Other Korean Wave" on the other side of Taepyeongno / Sejong-daero. Let's hope local authorities don't plan colorful LED dialogues between both landmarks: there's already enough cuttlefish chatting at night across the capital (City Hall, N-Tower, SMPA...).